Why do I hike? Why not? The author on top of Gemini Peak. Hi! 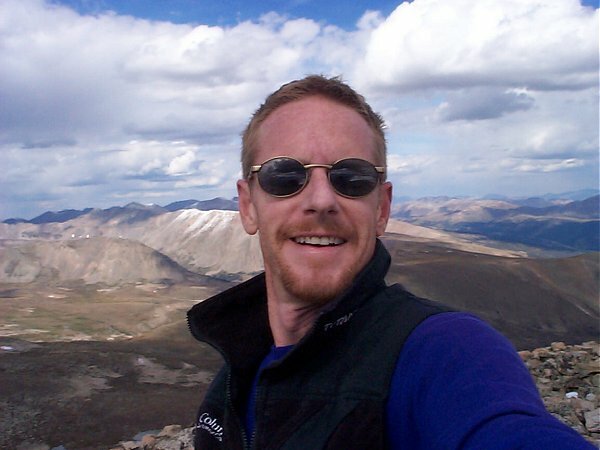 My name is Steve Fry and ever since I moved to Colorado way back in 1988, I have discovered how much I really like the outdoors. In the summertime I try spend as much time as possible up in the mountains as I have found that by immersing myself in nature, I am allowed a better understanding of the world around me. While I have you thinking along these lines, why not take several minutes to check out this excellent essay, Getting Lost: "Isolation is the Answer" by K.B. Morgan (originally published at Get Lost Adventure Magazine) which can give you a perspective with which I tend to agree. I never leave any trash and I always try to remove at least one piece of litter while on each of my hikes. Most of my early hiking was done in the White River National Forest as I used to live in the town of Glenwood Springs (which is located pretty much in the center of the forest). The White River National Forest is home to some spectacular mountains including some over 14,000 feet in elevation. My favorite mountain happens to be Mount Sopris (12,953 feet) which I have climbed every summer (13 times so far - turned around once) since moving to Colorado. It's not the tallest mountain around but it is one of the most impressive with over a mile of vertical exposure towering over Carbondale, Colorado, USA. Now that I live in Denver, most of my hiking has been on the front range and Continental Divide. If you are familiar with Interstate 70 West of Denver, Colorado, USA you will notice that many of the hikes listed are within several hours drive of the city. I have discovered that from Denver you can easily sneak away to complete many different hikes which allow me to rejouvinate my spirit in one day or less.